PCH, Divina Commedia Edition: Toyota-Powered Fiat 1100 or Lancia Beta Berlina? Welcome to Project Car Hell, where you choose your eternity by selecting the project that's the coolest... and the most hellish! As you saw in last week's episode, we love Italian Hell Projects! 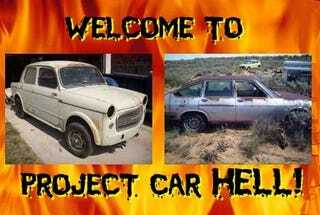 Project Car Hell, Fun With Fastback Fiats Edition: Dino or 128 SL Coupe? That's why we're going with a couple of classic Italian machines once again, only this time we're going a lot skinflintier on the budget side. Just how cheap are today's totally easy projects? 500 bucks apiece! That's right, we're looking at sure-fire Index Of Effluency contenders for potential 24 Hours Of LeMons teams. Whether you decide to race one of these beauties or turn it into a painfully cool daily driver, you should be able to do it by investing just a 55 gallon drum brimming with little sweat and a cubic foot of few dollars. Why is it that those lucky Yurpeans got almost all of the Lancia Betas? The first new model manufactured by Lancia after being taken over by Fiat, the Beta had a screamin' Fiat Twin Cam engine, front wheel drive, four wheel disc brakes, and all sorts of excessively complex innovative suspension features. You'd think they'd have sold like crazy in Malaise Era North America, but these days you'd be lucky to find one Beta per time zone. As for getting one for a 3-figure price, forget it! No, don't forget it, because this 1977 Lancia Beta Berlina (go here if the listing disappears), located in theoretically rust-free New Mexico, is ready to clank into your life for just cinquecento bucks! It appears that most of the paint on its horizontal surface has been burned off by the desert sun, and we must assume that the interior is in hopeless somewhat rough shape, but then we see those three magical PCH words in the listing ("ran when parked") and we know everything will be just fine! Thanks to five_on_ninetyeight for the tip. Front wheel drive? Unless we're talking about a Citroën or maybe a 500-cubic-inch Eldorado, it's tough to work up the motivation to sacrifice your mental, physical, and fiscal health on the Hell Garage altar for a front-driver. You've got plenty of Italian rear-drive options available, and things get even better when you start thinking about horsepower-doubling engine swaps. Say, a Fiat 1100 with the original 1098cc engine torn out and replaced with a powerplant nearly twice as big? But where would you find that, you ask? A Texas rattlesnake hissed out a message about this 1959 Fiat 1100 with Toyota engine (go here if the listing disappears), and we're passing it on to you! Only $500, and the engine-donor car drove itself to the garage under its own power. The engine looks like a Toyota A of some sort, and the front suspension from the unidentified Toyota was swapped in as an added bonus. Not only that, the seller says he's "built several before," so you know he or she must have all the engineering tricks worked out by now- most likely you'll be able to just smash your skull against tinker with it for several eternities a couple of afternoons and get this ToyoFiat into fully roadworthy (or raceworthy) shape!